How long 'til we see this again? 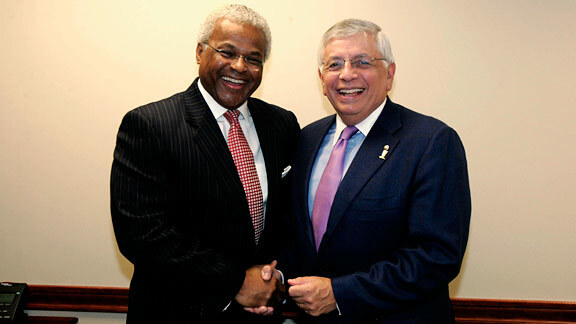 Billy Hunter and David Stern after agreeing to a deal in 2005. Huge point: The starting point of these negotiations was not "will the next deal be better for the players or the owners?" The starting point was "how much better will this deal be for the owners?" In other words, the players always accepted the future won't be quite as rich as the past. With that in mind, in 2010-11, players' paychecks totaled about 1.99 billion dollars after the 8 percent escrows were held back. After months of doom and gloom, and talk of big rollbacks of salaries, the league has now essentially offered to pay players $2 billion next season. I know, I know, that offer comes with plenty of unpleasantness for players in the future. But next year's salaries have got to be a, if not the, key issue among the current players who vote. With that in mind, I disagree with the assessment that the two sides are worlds apart. Just for fun, let's say the league offered to pay players $2.2 billion next season. Would a majority of players really prefer staying home to that? The union looked at all of the owners' various proposals and declared that they had real religion on hard salary caps and guaranteed contracts. The league has moved a lot on both issues. It has moved all the way to the players' position on guaranteed contracts, and the "flex cap" somewhere north of $62 million being tossed around now is a far cry from the hard cap of $45 million that was in the mix in March. Meanwhile, the players were nice enough to open negotiations with a vague but meaningful offer to take less money. The things both parties have given up meant a lot, and are, to me, another reason to expect the lights to be on this fall. The motivation behind a team-by-team hard cap is not to give owners a sense of how much players will cost. It's to give owners a sense of how much competing will cost. Now that we don't have the high-payroll, low-wins Knicks to kick around anymore, it's fairly clear that spending more on salaries correlates decently with winning (although the Bulls are an exception). The Mavericks spent the most and won. Teams that spent very little (Timberwolves, Clippers, Cavaliers, Kings) generally did poorly. Competitive owners like Mark Cuban -- who has faced steep losses in recent years -- are left in a tough position: win or be profitable? With a hard cap, Cuban's losses would be controlled or eliminated even as he goes all-out to beat the competition. This is a big decision for the owners to make. Cuban can save money right now by standing down in the never-ending arms race of signing all the best players. Is it worth a lockout to save him, and owners like him, from themselves? The league even has something like a team-by-team hard cap right now. The many constraints on pay (a maximum of 15 players, the rookie scale, the midlevel exception, maximum contracts, etc.) make it possible to spend only so much. If you have $200 million a year to blow on salaries, you simply would not be able to get it done under the current CBA, no matter how hard Isiah Thomas might have tried. I don't know what that maximum number is -- certainly it's more than $100 million -- but it's worth noting that in giving in to a host of salary limitations in the past, the union has effectively already agreed to a very high hard cap. What's on the table now is not the idea of putting a totally new cap in place. What's on the table is bringing the existing de facto cap down. Chris Sheridan pointed this out on Twitter, and he's dead right: Both sides are being fairly nice to each other. That means something -- from combatants like this, who are so well-versed in nastiness. I can't speak for hardline owners, but it'd be tough to convince me that players and league officials don't really want a deal. The story is that a hard cap would increase parity, and therefore TV ratings. But the best available evidence is that if it did do that, it would do so only a little bit. Another thing that's happening in these talks: The NBA is shifting a bit, from a league whose primary audience buys tickets, to a league whose primary audience watches on television. Television revenues have the potential to get so big that, like in the NFL, ticket revenue stops being make-or-break. The league and its owners are spending more than they anticipated on things like marketing (to sell tickets in a bad economy), paying coaches and GMs (who are making a lot), and expanding the game to China, Europe, India and Africa. Those are all smart things to spend on. But here's the kicker: When those things come with revenue, under the existing CBA, the league has to give players 57 percent of that revenue. So in theory the league could spend $100 million in China and make $120 million in revenues. Then the league would have to give players 57 percent of that $120 million in income, meaning that its fledgling overseas marketing efforts, even while technically in the black, would in fact leave owners something like $50 million in the hole. Makes it hard for the NBA to grow aggressively. That was a mistake the league made in the last CBA that it would like to fix now. Redefining "basketball-related income" is seen as nothing but taking money from players, but it's also a reasonable attempt to give owners incentives to do what's best for the league, including investing in China. Meanwhile, there are other kinds of income that the owners should share as they do in the current CBA: In a few years most owners expect to have a far bigger national TV deal. That income comes with very little added cost, and it makes all kinds of sense for owners to share that generously with players. Owners have tricky ways of making their businesses look like they're doing far worse than they really are. They get tax advantages. They get public money. They get a high profile (Mark Cuban on David Letterman, Mikhail Prokhorov ascending in Russian politics) that benefits their other businesses in untold ways. They get to do sweetheart deals with other businesses they own, whether that's the local cable channel, a jet charter company or the parking lot outside the stadium. It's tempting to assume, through all that, that owners who cry of financial pain are simply lying. And no doubt, in some cases, they are. It would take a hundred accountants, lawyers and economists a year to really calculate the profits and losses of most teams. There is one great equalizer, though, and that's selling the team. Whatever the total, real-world benefit of owning a team is, it's pretty much lost when you sell it. And so, if owning a team is so great, nobody would ever sell, and certainly nobody would ever sell at a loss. And yet sources insist that the Bobcats, Hornets and Nets -- and, depending who you ask now, the Sixers, Pistons and Hawks -- have all sold or are selling at "take this thing off my hands" prices. No small number of owners marinated in the benefits of ownership, weighed it against the costs, and wanted out. So, no, I'm not asking you to take the NBA's word for it that 22 of 30 NBA teams lost money last year. The math is undoubtedly more complex. But I am certain that plenty of NBA owners are not loving the current setup, and therefore it's not strange that the owners are driving a hard bargain, especially as a huge chunk of today's owners bought their teams in a good economy for hundreds of millions. They're like the people on your block who paid a fortune for their house -- they have far less wiggle room than the little old couple next door that bought for $30,000 in the 1960s. These owners are prepared to drive hard bargains.